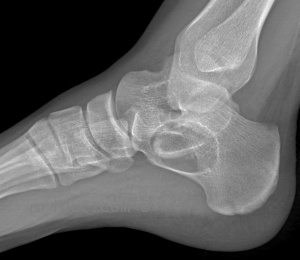 Well defined margins of the lesion and its homogenous appearance indicate non aggressive nature of this lesion. 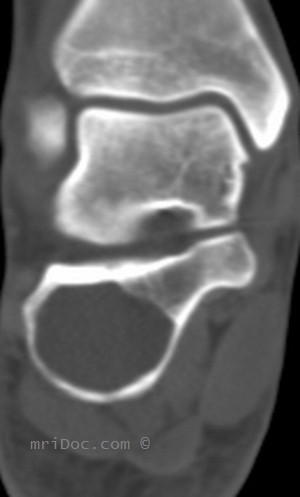 Pathologic fractures are rare. 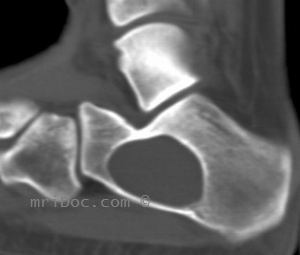 Differential considerations include pseudocyst of the calcaneus and intraosseous lipoma that can present with internal calcification. On MRI, unicameral bone cyst demonstrates hypointense signal on T1 weighted images, while lipomas are hyperintense. Lipomas will also become hypointense on fat saturated T2 weighted MR images, while fluid filled cysts will remain hyperintense.